WE ARE very concerned about Hawaii's dwindling near-shore resources. The total biomass of reef fishes in the main Hawaiian Islands is less than a quarter of what it was a century ago. While pollution, development and alien species are possibly all contributing to this loss, overfishing is the primary factor in the precipitous decline of our near-shore fisheries. When done responsibly, there are many ways to fish sustainably, such as pole and line, handline, throw net and breath-hold spearing. However, our populations of fishes cannot be sustained if large-scale and damaging fishing methods, such as use of lay gill nets, are allowed to continue. Lay gill nets are those that are weighted to the bottom, not the free-floating gill nets like those used for catching opelu. The state Department of Land and Natural Resources is proposing to strengthen regulations on lay gill nets as a fishing method, which we support. We hope that the state eventually will ban lay gill nets. Anyone who has dived in the Northwestern Hawaiian Islands, as three of the authors have, is immediately struck by the abundance of the larger fishes compared to the main Hawaiian Islands. Because of the distance from the population center in the main islands, the northwestern islands have been spared much of the impact of overfishing. The average biomass of important large predators, such as sharks and jacks, is 65 times greater than that in the main Hawaiian Islands. Most fishes in the main Hawaiian Islands are now caught before they reach their full reproductive potential. Also, larger fishes contribute far higher numbers of eggs. For example, omilu (bluefin trevally) do not reproduce until they reach 12 inches. However, if allowed to grow, a 27-inch female will produce 84 times as many eggs as a 12-inch female. Fishing in near-shore waters changed dramatically in the 1950s with the introduction of the modern, monofilament lay gill net. Previously, traditional gill nets made of natural fibers were very valuable and hence carefully used and actively tended. Because modern monofilament gill nets are relatively inexpensive, costing around $100, fishermen are more willing to risk their loss. This has led to nets being set and left unattended, often for several hours and even overnight. These rectangular nets -- which are generally 125 feet long by 7 feet deep and often sewn together to make much longer nets of hundreds, even thousands, of feet -- hang in the water like giant curtains. Lay gill nets have caused the depletion of coral reef fishes in many areas of the main Hawaiian Islands. By entangling many fishes at once, and sometimes catching and drowning protected species such as sea turtles and Hawaiian monk seals, the nets have proven to be devastatingly efficient and indiscriminate. Lay gill nets often kill species of fish that the fisherman is not seeking. These might include the young of species that would be of value if they had been allowed to grow to commercial size, or fishes that are valuable as prey to the targeted species. Lay gill nets often kill fishes that are undersize by law. If the fisherman were to catch them by hook and line, he would release them. But in the gill net, they are dead or dying. Fishes left in a gill net for more than about three hours have started to decompose and are discarded. Furthermore, fishes protected during their spawning season can be caught by gill nets, often more readily during spawning migration. The nets also remove species that play a key role in the health of the reef system. Gill nets catch large quantities of herbivorous fishes, and over-harvesting of fish that eat native algae results in unbalanced algae growth and declining reef health. If not set with care, lay gill nets can damage fish habitat. When removing them, fishermen lift the weighted nets over reefs, and they can break off branch coral. While those branches will grow back in ideal conditions, in the worst cases they can be overgrown by algae, which prevents the coral from recovering. With surge, these nets frequently get hung up on coral and are often abandoned. Abandoned gill nets can "ghost-fish" for years. 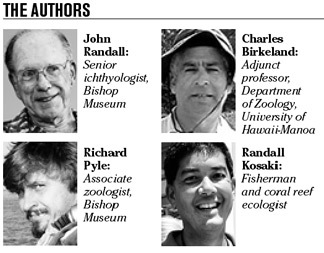 In 1998, state officials gathered nearly five miles of net from coral reefs in Hawaii in a six-month period. An entangled and abandoned net can cover and kill an entire coral colony because algae grows where coral is abraded, as well as on the net itself. In addition to the damage these lost nets cause to marine life, they also create an unsightly mess on our shores and reefs and are a hazard to navigation because propellers of boats may be caught in the nets. The nets are also dangerous for divers. Restrictions on lay gill nets already have met with success in Hilo Bay, where a gill net ban in 1987 resulted in increases in size of the main species previously caught by gill nets: akule, manini, white ulua and aholehole. Some Pacific Island nations, and all other coastal U.S. states, have restricted or banned lay gill nets. Hawaii should have been the first, not one of the last, states to enact strong restrictions.